“Spread yoga from door to door, shore to shore” was the mandate given to Swami Satyananda Saraswati by his Guru Swami Sivananda. Satyananda Yoga Centres around the world are carrying this mission forward and it forms one of the founding blocks of Satyam Yoga Trust. As a result of this mission, the divine wisdom of yoga freely flows from our Guru Parampara to the true seekers of this wisdom. Satyananda Yoga Centre, Mambalam has been an effective conduit for transfer of this wisdom and it is no wonder that, since 2001, month after month, hundreds of people have been having a taste of this nectar. People resort to yoga today for various physical and mental ailments. But isn’t it true that the ultimate aspect that every one is searching for is unending peace and bliss? The aim of the beginner’s course is to show people how they can make their lives more beautiful. We have firm belief that Yoga is the only true solution to the suffering humanity of this generation and beyond. Through this beginner’s course, we prepare people to take control of their lives so that it can become blissful. Thanks to the efforts of stalwart yogis who have graced the earth in the past few decades, yoga has today become a house hold name. It has gone beyond that and is even a much commercialized business today. Amidst all this, Satyananda Yoga Centre, Mambalam takes pride in proclaiming that our one month beginner’s yoga course brings to you the divine wisdom of yoga in its most undiluted yet scientific form and is absolutely free. 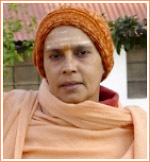 We believe that money cannot and should not become a hindrance in realizing our Guru’s mission. We truly and honestly want to serve our Guru by serving all strata of the society through the medium of yoga. 73rd batch of free one month yoga course started on 25th Jab 2009 with regular Initiation procedure. Nearly 200 participants including old students attended the function.